Quentin’s creative concept was to achieve a “retro-futuristic” bike by trying to think as if he were a bike designer in the 1920s. “It’s the opposite of conventional thinking. Instead of thinking how I could make a vintage motorcycle out of a new bike, I began to think how I could design a futuristic motorbike if I were using the resources and ideas available to someone from the ‘20s. 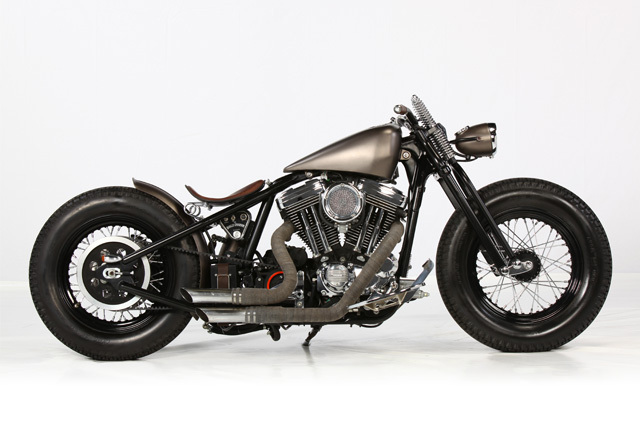 Needless to say, most of the new components were made by hand to stay true to this idea”. Work started with the frame. 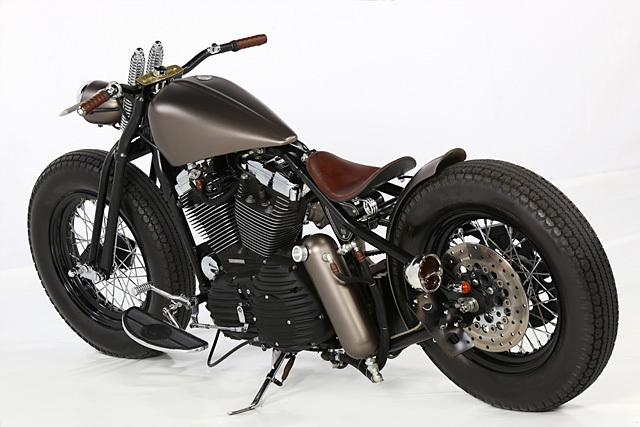 The original rear was dumped in favour of a bespoke hardtail that tweaked the geometry of the bike by stretching it 2 inches and lowering it by about 4. 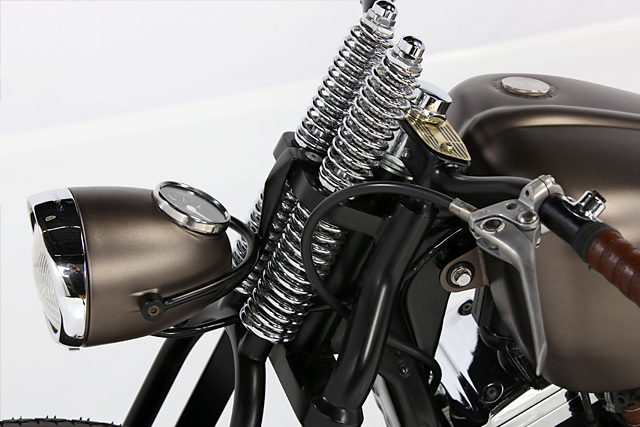 “Then for the forks and bars, I dumped the original shocks and made up a new set of springers. But the really interesting thing about the forks is the top triple tree. I wanted to lower the handlebars as far as possible, so I decided to weld them directly to the top triple tree. 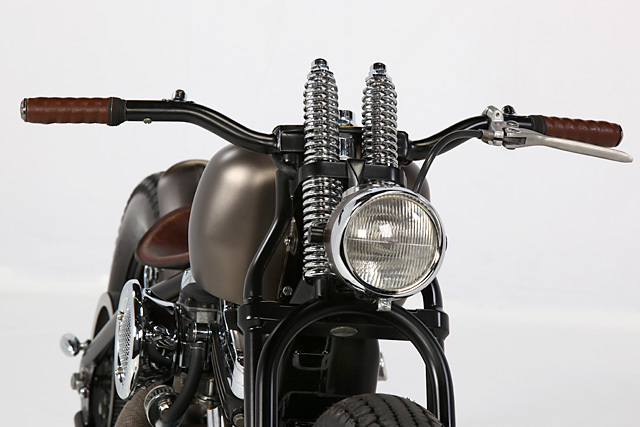 They are made from 6 pieces of tube and I used a classic scrambler shape for inspiration”. Great pains were taken to get all the fiddly bits inside the ‘bars, and Brooks leather grips were added to finish things up nicely. “Wheels? I used two old shovel hubs with some black aftermarket rims and Avon Speedmaster MKII tires to get a classic, hot rod look. The front light is an old CEV moped headlight; I love it because its size is perfect and you can put a speedo in it. I made lots of mods so I could put the Harley reflector system in it AND a Harley speedo as well. 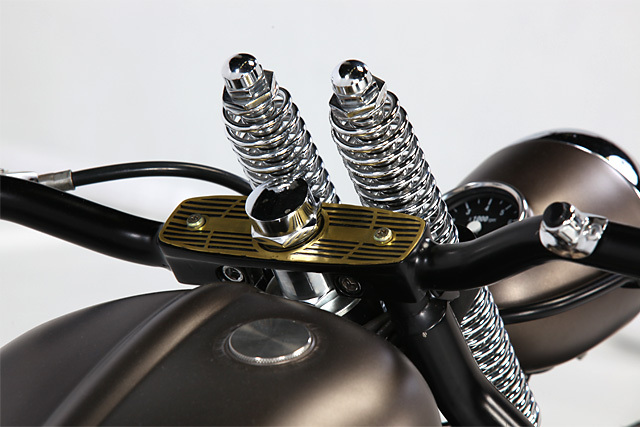 I worked on a mounting system which would complement the headlight’s shape. The rear light is a classic Ford duo lamp”. Quentin put lots of time into re-shaping the aluminium engine cover to make sure he reduced the rather heavy visual impact of the stock item. 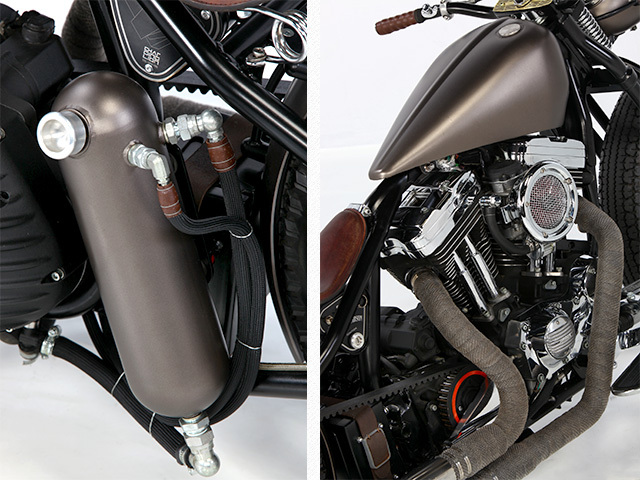 The primary cover comes from EMD and the air filter is a Velociraptor from Kuryakyn. 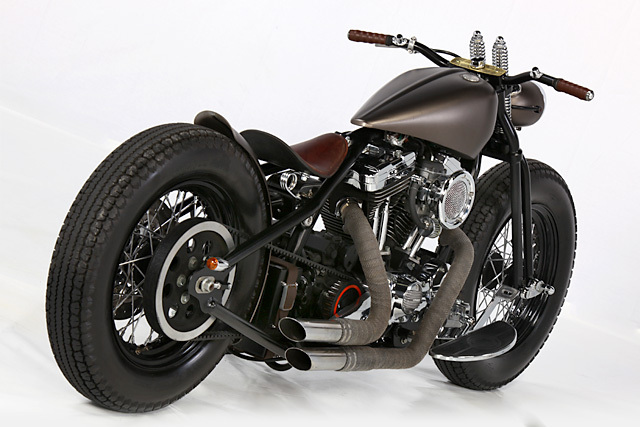 “The gas tank is a Cole Foster design. He’s a man whose work I really like. Big influence. 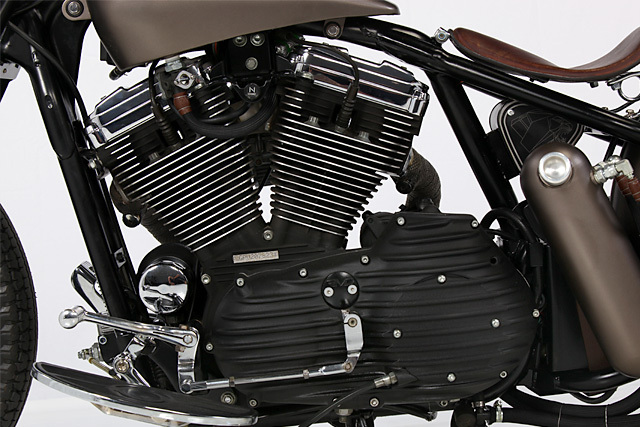 The oil tank is a CB750 aftermarket unit with a cool speedster-style that I adapted for the Sportster’s oil capacity”. 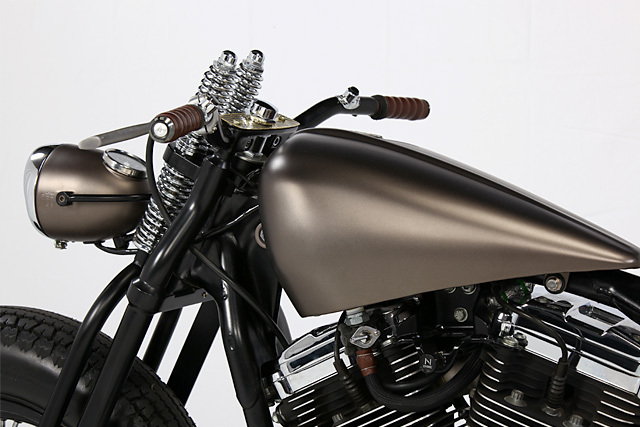 To wrap things up, the frame, boxed, fork and the gazillion other little pieces were powdercoated in black and all the bodywork pieces were sprayed in a colour called Frozen Bronze. “And yes,” says Quentin, “there’s no front brake. 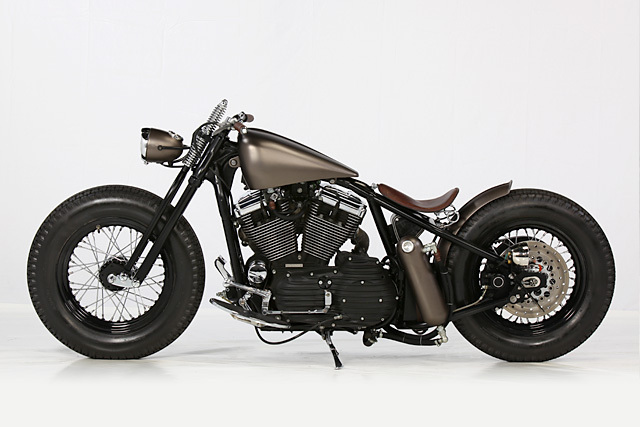 It’s a classic, clean bobber so I didn’t put one on. Whatever. 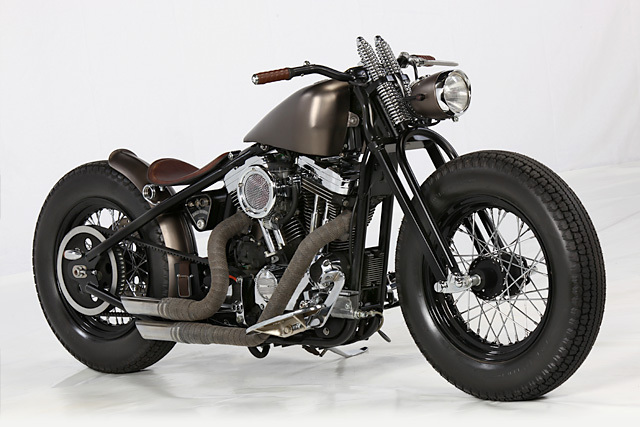 The rear one is an adapted Harley Sportster unit”. Touché.